It has always been the case on social media that left-wing Christians make a louder noise than those to the right, usually along the lines of: ‘How could a Christian vote Conservative, or even worse, Ukip?’ But it has been quite amazing watching even more declare their political leaning in the days leading up to the General Election, and then subsequently get quite upset when the result didn’t quite go their way. The vicar of St Mary Newington in Southwark has been by far the most high-profile of these. Plenty was said about him and his curious understanding of Scripture here yesterday, but he is far from alone in throwing his toys out of the pram of indignation. Who is to blame for the grave injustice which has prevented Labour from seizing the reins of power? Well, of course, it was Murdoch and the Daily Mail brainwashing their readers into voting for the Tories, wasn’t it? And it was the Tories themselves, with their campaign of fear, making everyone who didn’t want a Labour/SNP alliance vote for them. The SNP, too, were downright horrible for causing a near-total wipe out of Labour in Scotland. And finally, let’s not forget the majority of the population, and especially those middle class types who voted so selfishly for themselves and their own interests rather than the poor and vulnerable, who (let’s not forget) Labour care about more than everyone else. Truly, our country must have strayed far away from Christian morality and ideals to allow the Conservatives to get into government once again. Thanks to all those irresponsible people, our society is now doomed. Let’s have another look at this. Could it perhaps be just a teeny bit possible that the reason Labour had their worst General Election result since 1983 was that they just weren’t up to the task, and the public didn’t like what they saw? It’s all very well saying you’re going to look after everybody, but if no one believes you, what good does it do? There are probably two main reasons why Labour lost this election. One was that voters still haven’t forgiven them for the state the country was in when they lost power in 2010. The other was the unions hijacking the subsequent leadership ballot and placing Ed Miliband at the top of the party ahead of his brother David. 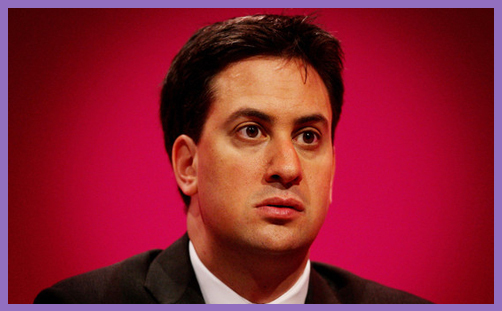 Ed proved that he had a great deal of conviction, but the public never truly warmed to him. It wasn’t just the slight awkwardness of his appearance and mannerisms, but his political mindset, too. His belief that the Tories were intellectually and morally bankrupt was reflected in Labour policy. There was more energy spent talking about the need to undo the work of the Coalition government than building a vision which would resonate with the electorate. We waited five years for one to materialise, but it never did. Shadow Business Secretary Chuka Umunna observed: “(We) sometimes gave the impression that (we) weren’t with the wealth creators. You’ve got to be with the people who create wealth because they create jobs.” These sentiments have been echoed by Lord Sugar, who has now deserted the party altogether. But the most devastating comments have come from David Miliband. Speaking to the BBC he had few words of comfort for his brother. He said there was “absolutely no point in blaming the electorate” for the election result because “they didn’t want what was being offered”. He added that both Ed and Gordon Brown had “allowed themselves to be portrayed as moving backwards from the principles of aspiration and inclusion that are the absolute heart of any successful progressive political project”. This is a Labour Party that has not been at ease with itself for some time, and the tensions and frustrations have finally boiled over. Is such a discordant and divided party, lacking any real degree of self-awareness, really in a fit state to run the country? This is why it is so difficult to understand those Christians who have been saying – often quite forcefully – that Labour is the party which is going to be the most just and fair in government. Certainly, all Christians should desire parties in power to consider the welfare of all citizens and not just those who are able to look after themselves. But alongside this is a basic need for governments to be competent. Too many voters simply didn’t think Labour would do the best job, and judging by the research leading up the election, there is a likelihood that a higher proportion of Christians voted for the Conservatives than the population at large. Are they all traitors to their faith, or have many prayed and attempted to exercise sound judgement, bearing in mind that no political party is perfect? Many Christians have expressed their opposition to the ‘bedroom tax’ and other punitive measures in the benefits system which were introduced after 2010. Many are likely to be nervous about where £12 billion of welfare cuts will fall, but they still decided that Labour would not deliver a better, more ‘Christian’ alternative which might guarantee more security or stability for anyone. There is no doubt that Jesus considered the fair and compassionate treatment of the poor and needy as one of our highest callings, but that does not make him a Socialist. If anyone thinks the Labour Party in its current condition is the natural home for Christians, then, in order to justify their view, they need to do a lot more than kick up a fuss or put down others – especially Christians – who disagree with them. As things stand, with such limited vision and direction, endorsements on the grounds of faith come over as little more than just blind naivety.